Recently, ketamine has made resurgence in the areas of emergency and pre-hospital medicine, and for good reasons. Ketamine was first developed in 1962 and is on the WHO Model List of Essential Medications. Ketamine is commonly used for pediatric sedation in emergency or operating room settings prior to painful procedures. 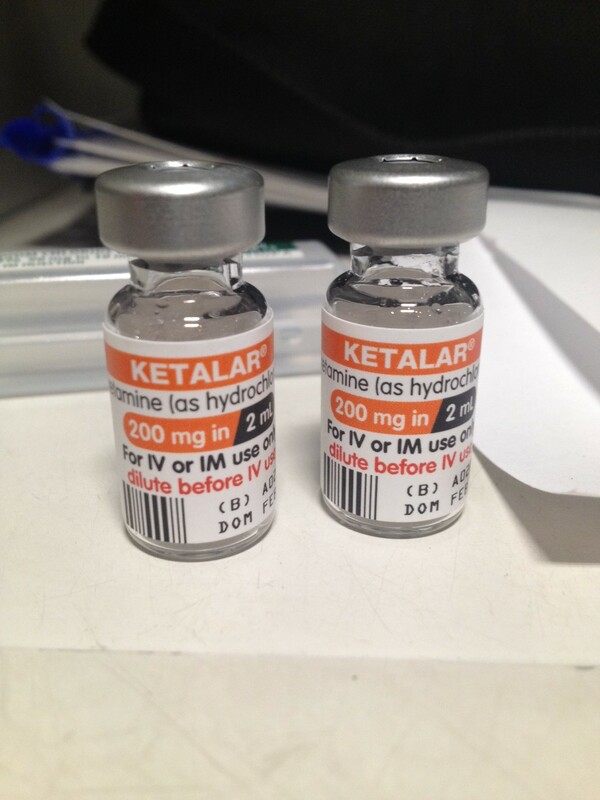 The safety profile and effectiveness of ketamine make it an ideal medication in the pre-hospital setting. The use of ketamine in EMS has been somewhat limited to sedation for psychosis, other behavioral health issues, and intubation. In 2011, the Committee on Tactical Combat Casualty Care (CoTCCC) added it to the Tactical Combat Casualty Care (TCCC) guidelines and soon after the Defense Health Board authorized it for battlefield/pre-hospital analgesia. Ketamine acts as an N-methyl-D-aspartate (NMDA) receptor antagonist, but also binds to the mu and kappa opioid receptors. It can be given intravenously (IV), intramuscular (IM), intranasally (IN) and by mouth (PO). Ketamine is a dissociative anesthetic with a recommended dose of 1.0-2.0 mg/kg IV; onset is typically within 1 minute, with effective dissociation in 5-10 minutes. When given IM, dose range from 3-4 mg/kg with onset between 5-20 minutes. [2,3] Above 1.5 mg/kg IV dose, there does not appear to be any deeper sedation, only longer duration.3 Ketamine also offers analgesia in sub-anesthetic doses, depending on the literature; doses may range from 0.2 mg/kg-1.0 mg/kg IV. The U.S. Military has successfully been using ketamine on the battlefields of Irag and Afghanistan for the past several years. The CoTCCC recommends 20 mg IV or 50 mg IM/IN for the initial dose with multiple anecdotal reports discussing great effects. The 75th Ranger Regiment has used ketamine since 2009 and has noted good effects and safety in a small case series with larger doses; their current protocol uses ketamine at 75 mg IV and 250-500 mg IM. With the increased use of ketamine by the military and emergency departments, is it time for more wide spread use of ketamine by civilian EMS systems? If so, should it be used instead of opioids for analgesia in the pre-hospital setting? In conclusion, ketamine has provided safe and effective anaesthesia/analgesia for this cohort of trauma patients that includes adults and children, polytrauma, patients with a changed level of consciousness, and patients who are hypotensive due to hypovolaemia. For the non-anaesthetist it is essential that the immediate care practitioner maintains their knowledge and skill base to be able to confidently manage any airway compromise that may occur.